In August 2011, when Patricia and Martin Knudsen’s son Michael suffered a horrific electrocution death at Clinch Park Marina, the couple thought they had hit the lowest point in their lives. What they didn’t yet know is that losing their son was only the beginning. 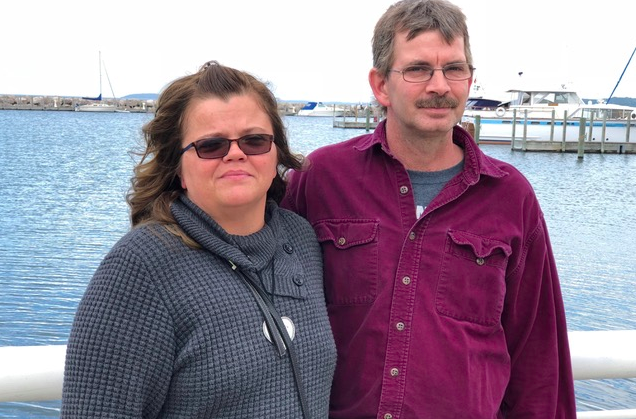 The couple sued the City of Traverse City, the marina, officials, and numerous contractors who had designed and installed the marina’s faulty electrical system, but that sprawling lawsuit was dismissed. As that case fell apart, the Knudsens sought a second opinion; and the couple’s new attorneys sued their original lawyer, Geoffrey Fieger, for legal malpractice, arguing that he overlooked a strategy that could have prevented their lawsuit from getting dismissed. The malpractice suit was also dismissed, and it is pending before the Michigan Court of Appeals. Next, Fieger sued the Knudsens, their new attorneys, and Dean Robb, the Suttons Bay lawyer who connected Fieger and the Knudsens in the first place. Fieger’s lawsuit alleged that the defendants conspired to set him up for a malpractice case. That last twist is what’s so baffling to the Knudsens. Patricia Knudsen works in the shipping and receiving department at Munson Medical Center. Martin Knudsen works as a machinist. They live in the woods outside of Mancelona. Fieger filed his lawsuit against the Knudens, their attorneys, and Robb in Wayne County. As the litigation grew to contain over 1,000 pages of motions and notices and documents, it was transferred — despite Fieger’s objections — to Grand Traverse County, where the Knudsens were dismissed from the suit earlier this year. It’s been a confusing and painful whirlwind for the couple, who have never received any compensation for their son’s death at age 18. Despite everything, Patricia Knudsen, who was Michael’s stepmom and part of his life since he was five years old, said she believes they have achieved something important since his death. The publicity about their son’s death — and about the injuries suffered by his friend, Zachary Kott-Millard — from jumping into electrified waters at the marina spurred marinas across the state to make certain their electrical systems were up to code. That’s a significant step forward, Knudsen said, because more than anything else, she doesn’t want what happened to her son to happen to anyone else. But the legal experience left the couple disillusioned. What makes them most upset, the couple said, is that they never had their day in court, and the city and the marina were never held accountable for mistakes that led to their son’s death. Since they were dismissed from the lawsuit filed against them by Fieger, she said they are moving on with their lives. They hold a celebration of Michael’s life every August, a large get-together with friends and family. They planted a tree near a fire pit on their property one year after Michael died, and now the growth of that tree marks the passage of time. Still, Knudsen said she hopes the Court of Appeals reopens the Fieger malpractice case. In the days following Michael Knudsen’s death, a friend told Patricia Knudsen that she should call Robb, the Suttons Bay attorney and a storied civil rights activist. Robb, who was then in his late 80s and not able to handle the case himself, connected them with Fieger, a combative lawyer from Detroit who is perhaps most famous for representing Dr. Jack Kevorkian, a pathologist supported the rights of terminally ill people to die by physician-assisted suicide. Fieger, the one-time Democratic candidate for governor remains a familiar face across the state through is television ads. Knudsen said they went with Fieger because they knew he would be brash and loud and bring attention to the dangers that took their son. “He asked to help us and met with us and said, ‘I will fight to the end,’” she said. As the case progressed and rulings were not going their way, Knudsen said she decided they should seek a second opinion. Robb helped out again. He connected the Knudsens with Richard Goodman, another famed Detroit attorney, who looked over the case and determined that Fieger missed a strategy that could have advanced the lawsuit despite governmental immunity: suing under maritime law. Once the Knudsens fired Fieger and filed a malpractice lawsuit, they said they saw another side of Fieger. “We became the enemy, and then the fight was on,” Knudsen said. Feiger has a different take on what transpired. He insists he was the victim of a conspiracy, and he makes no apologies for suing the still-grieving couple. Fieger insists that the couple was manipulated by Robb and Goodman to sue him. According to Fieger’s lawsuit, he was discharged as the plaintiffs’ attorney in November 2015. Fieger claims he was strung along throughout 2015 as Robb and Goodman conspired to come up with a way to make him pay the damages in the case. Fieger argued in his lawsuit that the defendants “grossly compromised the underlying cases in order to falsely construct a legal malpractice case” against him. Robb, the Knudsens, and their new lawyers argued that they merely sought a second opinion when their case wasn’t going well, and they deny that there was a conspiracy against Fieger. The Knudsen’s lawyers in the malpractice case, Goodman and Kathleen Kalahar, did not return messages seeking comment. In response to the malpractice case, lawyers for Fieger argued that the maritime law claim was a “legal sham” because docks are legally considered extensions of land, and maritime law didn’t apply. They also argued that Robb and Goodman had plenty of time to make a maritime claim themselves if they thought that was the best strategy, but that they never made that move. Fieger said in the interview that the fact that Robb, his co-council in the original lawsuit, was not named in the malpractice lawsuit is evidence that Robb conspired against him. Robb, who is 94 years old, denied that in an interview from a bed at Munson Medical Center in early October. He said he acted out of a duty to his clients, the Knudsens. Robb’s wife, Cindy Robb, said her husband helped with the malpractice suit because, even though he had been friends with Fieger for decades, he felt he had a duty to serve the interests of the Knudsens. Ultimately, Circuit Court Judge Thomas Power dismissed the malpractice case, but he did so before the central question over maritime law could be sorted out. Power also dismissed the case with misgivings about a court rule that absolves attorneys of responsibility as long as they exercise “judgement” in coming up with a case strategy. From the bench, Power criticized the court rule under which Fieger’s malpractice case was dismissed, calling it a gift to lawyers from a conservative Gov. John Engler- appointed state Supreme Court. “While I think the rule is impossible to justify in any intellectually honest way … it’s the law of the land,” Power said at one of the hearings. Traverse City attorney Grant Parsons, who represents Robb in Fieger’s lawsuit, said he believes Power applied the rule too broadly. This case started out as a tragic instance of death and injury suffered by two teenagers who unknowingly jumped into electrified waters and were electrocuted. Over the years, however, the lawsuits would become defined by the relationship between Fieger and Robb. Robb, who started practicing law in Detroit in 1949, was close friends with Fieger’s father, Bernard, early in his career. The families vacationed together when Geoffrey Fieger was a child, Cindy Robb said, and Robb served as a mentor to Fieger when he started out as an attorney. There is an email written in March 2016 from Robb to Fieger that is included as an exhibit in one of the filings in Fieger’s lawsuit that demonstrates just how strained the relationship had gotten following the failed civil lawsuit and the malpractice suit. In the email, Robb explained that he had just turned 92 and had recently been diagnosed with macular degeneration and was going blind. “The last thing I needed or wanted was to be accused of being a co-conspirator against you,” Robb wrote. Robb told Fieger he was disappointed with the way Fieger handled the original case, and that he was heartbroken that the family members and surviving victim never got a day in court before the lawsuits were dismissed. The acrimony between Robb and Fieger peaked in January 2017, when Robb travelled to Detroit to be questioned by Fieger. Fieger participated in the deposition through a remote video hook-up. The deposition started plainly enough. Robb explained that he used to work with Goodman’s father, Ernest, and that’s how he found the attorney who would review how Fieger handled the original case. Through his questioning, Fieger accused Robb of trying to use the electrocution case to get one last big paycheck for himself. Fieger countered that, if that was true, then why had Robb “insisted” on a 40 percent finder’s fee for handing the case over to Fieger. Robb disputed that and insisted the 40 percent fee was Fieger’s idea. Robb testified that Fieger approached him at a cocktail party having heard about the Clinch Park Marina death and asked him about the case, saying that he’d handled a similar one in Florida and reached a $25 million settlement. “You offered that, Geoff. … You came up to me and solicited the case when you heard about it, and you said you would give me the 40 percent fee and pay all the costs,” Robb said. Cindy Robb said that her husband never asked for money in the case, and that Robb has no fee agreement — and stands to earn no money – in the malpractice lawsuit. Fieger still insists that Robb was only in it for the money. Fieger said it is unfortunate that a lifelong friendship ended this way, but he said he couldn’t let it go because he believed what Robb did was wrong; it doesn’t matter that Robb is 94 years old. Cindy Robb said she believes she understands why Fieger is so upset. Parsons, who was present at the deposition, said he believed Fieger bullied Robb, but he also believed Robb was able to hold his own. There may be another reason why this case got so ugly: It is increasingly difficult to win lawsuits in Michigan, and that has left attorneys in some cases only able to go after each other. Tort reform has made it almost impossible to win damages in a personal injury or death case in Michigan, said downstate personal injury attorney Eric Steinberg, who is not involved in the Knudsen case. The first changes came in the mid-1980s when it became harder to win medical malpractice lawsuits in Michigan. Tort reform really ramped up in the 1990s under Gov. Engler, however, Steinberg said. A major tort reform bill passed in 1996 was followed by waves of decisions from a conservative state Supreme Court that have made it challenging to even win lost wages or cover medical bills in personal injury cases, he said. Steinberg believes tort reform — in particular, governmental immunity — is responsible for how bad the roads have gotten in the state. Local governments are no longer liable for bad roads, so in some places they’ve just been let go. This summer, after Power dismissed Fieger’s case against the Knudsens and their son’s estate, and ordered Fieger to pay sanctions for attorney fees and costs that totaled over $130,000 for the case brought against the estate, Fieger sought to have Power disqualified from the case. Parsons called Fieger’s lawsuit hypocritical, because attorneys routinely sue other attorneys; it’s not supposed to be personal. Fieger called Parsons an “idiot” and disputed that that’s how the legal profession works.